Juba Electric, Co., Inc. is committed to providing all its customers with the most reliable and timely electrical services at competitive prices. From the largest project to the smallest service call, you are guaranteed that you will receive prompt, professional service from Steve and his staff of licensed electricians. Juba Electric was founded in 1923 and is located in North Andover, Massachusetts. 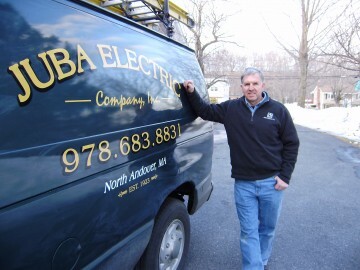 Serving the Merrimack Valley for three generations, you are in good hands when you hire Juba Electric to service your home or business. No Job Too Small. . . Give Us A Call, has been our tagline and we mean it. No matter what size your job is, you will receive the same attention to detail and quality workmanship. Juba Electric stands by its work and guarantees its work and materials.